Following a very tough winter and virtually no spring and with a season deteriorating by the day, Anthony Hurst presented his rams in wonderful breeding order last Friday. Almost entirely paddock reared, the offering of 42 Suffolk rams and 129 White Suffolks was keenly sought after by the many return buyers who know the great performance they consistently get from the Seriston rams. In the Suffolk section 35 cleared to a top of $1,700 to record an average of $884, well up on lasts year’s 29 which averaged $866. The White Suffolks also record a healthy increase in both numbers sold and average. 124 sold to a top of $1,700 to an average of $870, well up on last year’s 116 which averaged $822. Overall the average for the 159 rams sold was $873, up $43 on last year and with a 93% clearance. Richard Smith with his very active agent Leigh Warne of Landmark Naracoorte stepped in early in the White Suffolk section. Buying for RD & MA Smith “Lampshed Farms” Edenhope, Richard selected 11 rams for an average of $1,336 which included Lot 25, the top priced ram at $1700. Holmwood Pastoral from Lucindale followed up last year’s major purchase of 14 head with another 11 Whites to a top of $1,000 and at an average of $818. In the Suffolk section the Hann family “Nampara” at Penola returned again this year to be the volume buyer and purchased 10 to a sale top of $1,700 and at an average of $1,300. Last year they purchased 11 for an average of $963. 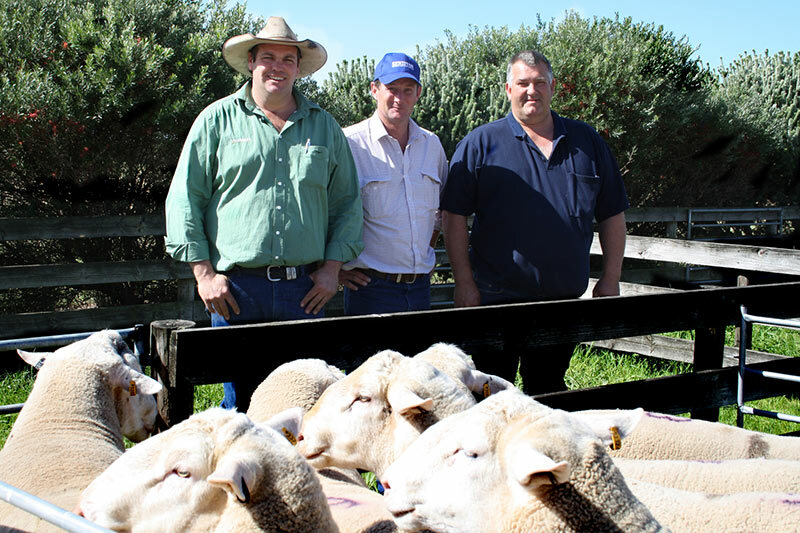 Leigh Warne Landmark Naracoorte, Seriston principal Anthony Hurst and major buyer Richard Smith from Edenhope looking over the 11 rams Richard purchased for RD & MA Smith partnership for an average of $1,336. Sponsors’ prize winner, Jason Elliott (right), “Heathfield Rural”, Bool Lagoon received a $200 voucher from Coprice and 2 bags of dog food presented by Seriston principal Anthony Hurst. Heathfield Rural purchased 6 rams for an average of $875. JA & SM Jensen selected 4 Suffolks to $1,000 to average $925 for their Pinnaroo area property. Millicent clients Sunray Past Co also took home 4 Suffolks, as did Old Fairview from Lucindale. Tecno Grazing from Mt Burr and were after numbers put a wonderful base in the sale, selectively securing 10 White Suffolks in the $500 to $600 range. KM & RM Skeer from Millicent selected 8 head to $1,200 to average $1,050 and Lake Hawdon Props, at Robe also purchased 8 rams to $1,000 at an average of $856. Winner of the Coprice sponsors’ prize of $200 and 2 bags of dog food was Jason Elliott, Heathfield Rural who took home 6 head for an average of $875. RA & MJ Jones, Lochaber selected 7 head, as did MS, CC & RB Johnson, Lucindale who purchased 9 head last year. Geoff Agnew, the manager of the Baker Group of properties from Furner stepped into the sale early and purchased 5 rams to the equal second top price of $1,600, and at an average of $1,260. He also accepted the Gallagher sponsors’ prize of a Fence Energiser on behalf of the Baker Group from the Federal Member for Barker, Tony Pasin. Speaking after the sale Seriston principal, Anthony Hurst expressed great satisfaction with the result. “We have had a very adverse season, and to achieve a tremendous clearance of 93% with virtually all our purchasers being return buyers, we’re very happy” he said. The sale was conducted by Elders and Landmark with Ronnie Dix and Gordon Wood the auctioneers. Tony Pasin, Federal Member for Barker is pictured presenting Baker Group Manager, Geoff Agnew with the Seriston Sponsors’ prize from Gallagher of a Portable Fence Engergiser. Tim Merrett, Chay & Merrett Millicent is pictured making sure he has the correct rams on board after purchasing 10 Suffolk rams for 3 clients at the Seriston ram sale. Ian “Church” Mason, Elders Lucindale purchased 8 rams at $800 for RA & JA Legoe and is pictured with Peter Tregoweth, Lucindale who purchased 2 rams at an average of $1,175.